Although I love breakfast food, the breakfast food I love most is that special-occasion-Sunday-brunch kind of food that you just can’t eat on a regular weekday because it’s either too rich or too time consuming to make. As a general rule, I tend to be a savoury unami person and so, a lot of the easier breakfast options are of the sweet cereal kind, which was why I was so taken by the idea of savoury porridge when I first saw it on Pinterest last summer. In the middle of summer, porridge for breakfast was out of the question and when I did finally make it to the cooler months, my original Pinterest inspiration was served with cheese and fried egg on top and seemed like more of a special occasion brunch than something you could eat every day. 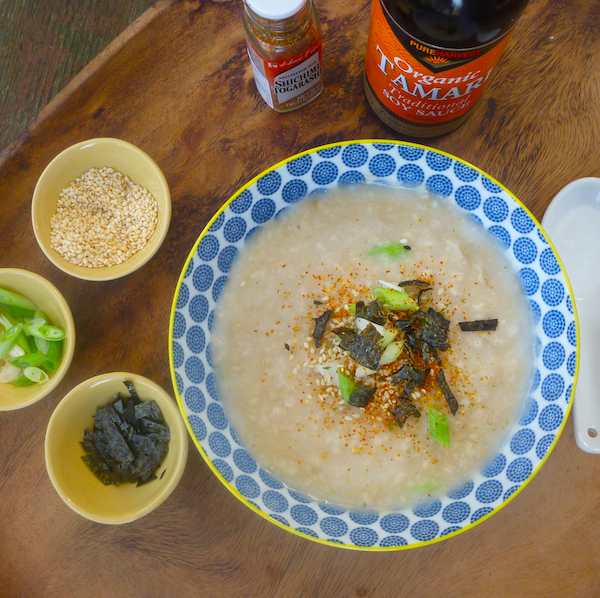 When I first came across this savoury porridge, I must admit the idea of soy sauce and green onions in porridge did make my head spin a little and it was probably only that it came with the Mark Bittman imprimatur of approval that tempted me to try it. I’m glad I did because really if you get rid of the whole sweet porridge with milk and sugar idea, then this is really just a super quick congee. The other great thing about this is if you can’t convince your family or friends to eat their porridge this way (as I haven’t), you can still make a big pot of porridge and they can eat their porridge the traditional way, and you can eat your savoury porridge with the fixings of your choice. 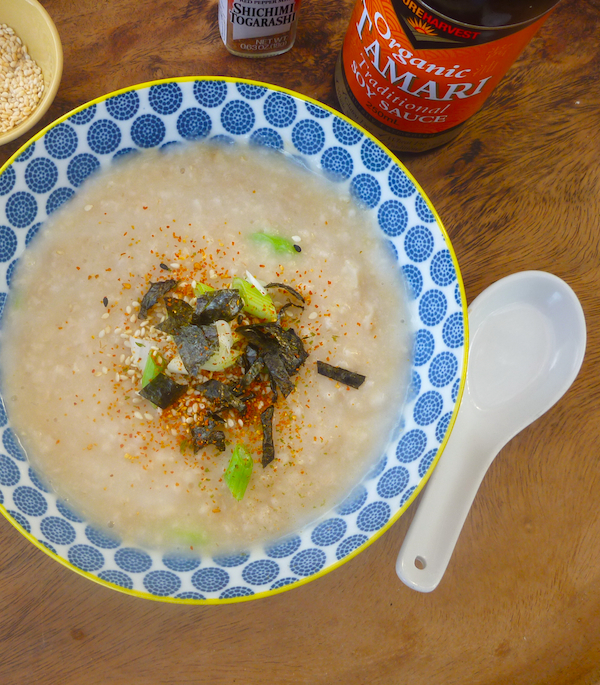 When I first made this porridge, I had some Japanese nori and sesame rice sprinkle, so I sprinkled some of that on and nori and toasted sesame seeds became my extra topping of choice – a lot of times, I sprinkle on some Shichimi Togarashi (pepper sprinkle) on, as well for a little bit of heat. So, it’s become a bit of a Japanese/Scottish/Chinese fusion thing but somehow it works. Even when I eat my porridge the traditional way, I prefer a slightly runnier gruel-like consistency, which works well here for more of the congee like effect but, really, you just make the porridge the way you like it and add your fixings to taste. 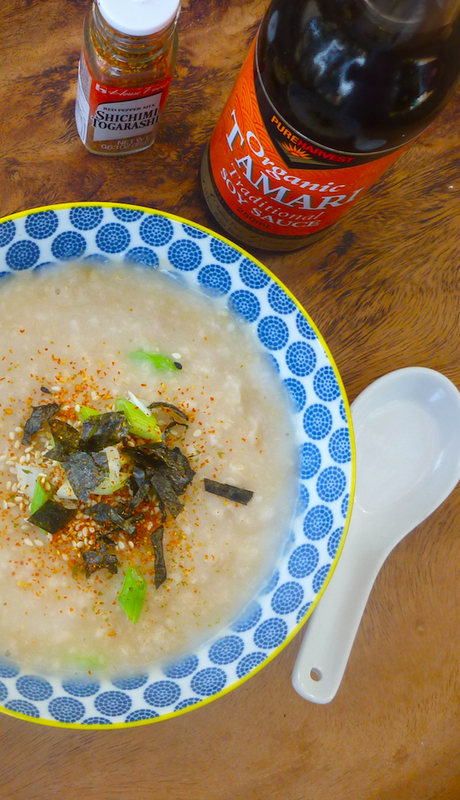 If the Asian style porridge isn’t your thing, The Kitchen has a round up of savoury porridge ideas. The recipe for Mark Bittman’s savoury porridge is below; it’s not much of a recipe really but more of an idea you can run with. Any of the traditional congee toppings – toasted sesame seeds, a boiled egg, finely shredded ginger, pickles or fermented tofu would work here. Cook oats with salt in your usual way. Stir through sliced onion and soy sauce and add any toppings of choice. You know, I’ve been adding salt to my sweet porridge lately but it didn’t occur to me that I could have savoury porridge! So glad you’ve linked this one up! How interesting! I posted a savory porridge recipe recently after finding out that it was common in an old Arabic recipe cookbook to prepare oatmeal as one would rice or bulgur. It was cooked in a meat broth with bits of meat and veggies. I like the simplicity of this dish, and I am sure it is also healthy! I remember that post, it was a really interesting dish. I didn’t make it because of the meat but it looked good.